The Mexican drug kingpin who was surprisingly and hurriedly extradited from the country to the US has pleaded not guilty to 17 separate charges brought against him by a US federal court. 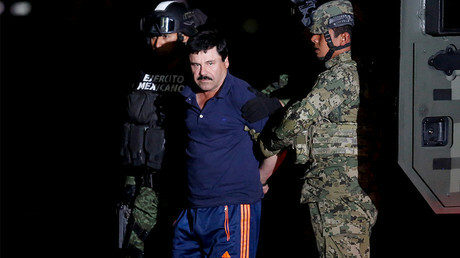 Joaquin “El Chapo” Guzman who is believed to have run the world’s largest drug network and who twice broke out of prison in Mexico, pled not guilty to all 17 criminal charges, Reuters reported. Guzman was represented by two lawyers at the plea hearing heard by a federal court in Brooklyn, New York. The prosecution is seeking a life sentence, Robert Capers, the US attorney for the Eastern District of New York, told a news conference on Friday. More than 40 witnesses could testify in court against the defendant, Capers said, adding that it may take “many” weeks before the trial is concluded. A plane carrying Guzman to the US landed at New York’s MacArthur Airport late on Thursday soon after the Fifth Collegiate Criminal Court in Mexico City denied him protection under the country’s laws. The extradition was approved by a Mexican court as early as May, but was put on hold after his lawyers filed an appeal saying that their client could face the death penalty in the US. The appeal, however, was overturned by the Mexican Supreme Court on Thursday, January 19. “The Justice Department extends its gratitude to the Government of Mexico for their extensive cooperation and assistance in securing the extradition of Guzman Loera to the United States,” a US Justice Department statement read in response to the decision. Guzman, 59, who commanded the Sinaloa Cartel, faces multiple homicide, drug, money laundering, and firearm charges. The timing of the quite unexpected and quick extradition seems rather ambiguous with some saying it’s a “farewell gift” to Obama’s administration and others believing that Mexico didn’t put “a whole lot of thought” into the move that came a day before Donald Trump's inauguration ceremony.